This is a doll acquired through e-Bay. 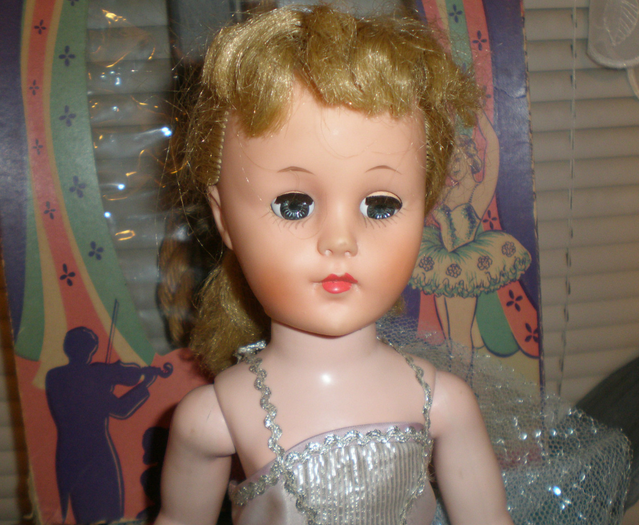 She has no doll marks or identification of any kind on her. She was most likely a "grocery store" doll. 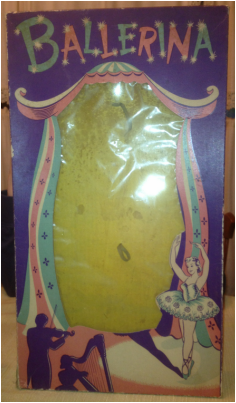 This came from a local estate sale so I do not know the history of this doll. Looking into the lower leg through the squarish hole at the ankle revealed that a previous owner has tried to reattach the feet by using a bent cotter pin in one leg and a bent bobby pin in the other leg. The metal pieces were bent into an upside down "w" shape so that they would spring open when inserted into the ankle. The lower leg is hollow with no attachment points all the way up to the knee joint. A rubber band was used to connect the metal clip to the string loop attached to the "u" valley in the foot. The rubber bands deteriorated which caused this system to fail. It is doubtful that this fix was very successful. I decided to try a different fix after removing the metal pieces that were rattling around inside the lower legs. Folding the knee all the way back revealed holes on either side of where the lower leg attached to the upper leg. I ran a very fine wire down through one hole, out the bottom of the lower leg, around the "u" valley in the foot, and back out the other side of the knee joint. I cinched the wire up tight, which brought the foot into the correct position. I then twisted the wire ends together and cut off the wire, leaving some excess wire at the ends. The ends were then poked down into the knee holes and the knee joint straightened. The wire was fine enough that the knee still functioned and the wire was invisible. 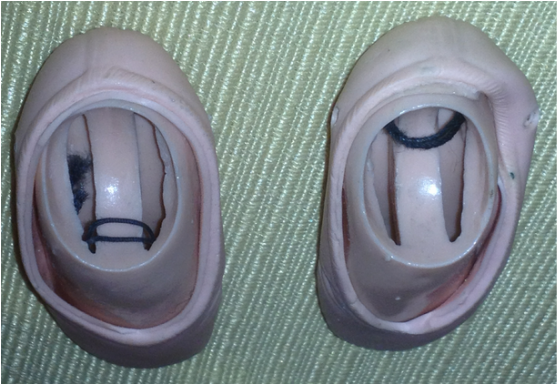 The feet still articulate at the ankle joint but not as well as they probably did when first manufactured. 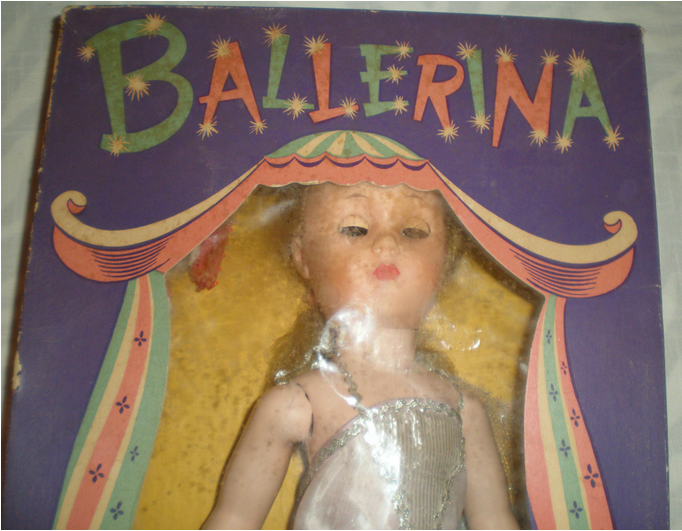 Figure 1 - Brandless ballerina with detached feet as posted on e-Bay. She is posed in front of the lid to her box. 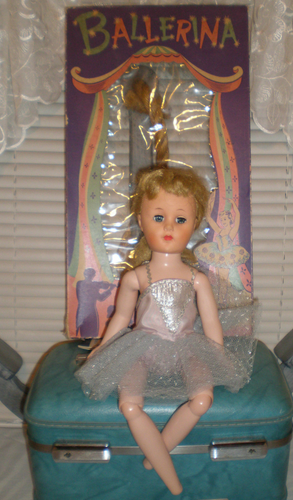 There is an anchor in the background with a rope attached to it; that is not the doll's ponytail. The trunk and anchor were not part of the purchase. 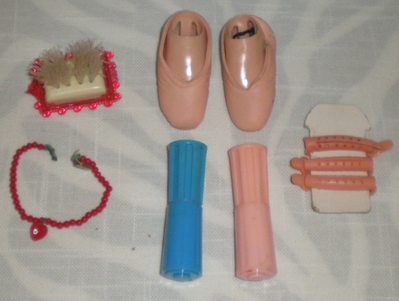 Figure 6 - the accessories that came with the ballerina (with her detached feel still in her ballet slippers shown in the upper middle of the photograph). Figure 8 - the feet with the string loops still in place from a repair attempt by a previous owner.